This post was supposed to go up almost 2 weeks back but something or the other kept coming in the way. I'm glad the post is up finally! So you know that soaps and other bath products make me super happy. Somewhere around the last month Soap Opera sent me some amazing soaps to try out! I was super excited and i'm reviewing the first soap that is used i.e. the Strawberry soap. 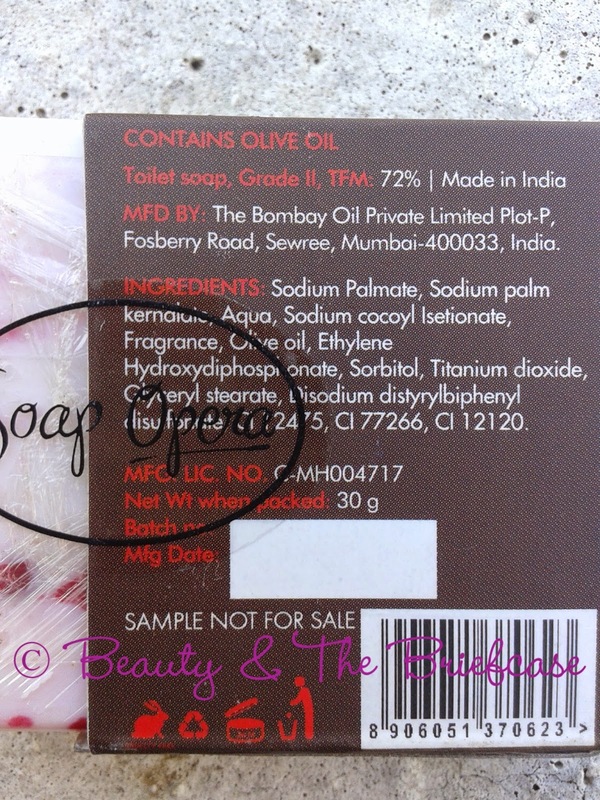 Read on to know more about this brand as well as the soap. Soap Opera is a premium personal care products company. It has a range of products under two brand names - Soap Opera and Puresense. The brand Puresense carries a range of non toxic personal care products. Their soaps, shampoos and body washes are sulphate free, paraben free & non - carcinogenic.Their portfolio also includes body mists & a very special product - the sleep inducer. You can check out their products Here. Whereas, Soap Opera specialises in hand crafted, hand poured designer soaps. These glycerin soaps come in a range of over 50 shapes in vibrant colours, sizes and fragrances. The soaps make a perfect gift with their elusive packaging and great fragrances.You can check out their products Here. Enriched with the goodness of Strawberry and olive oil, the soap bar is free of sulphates, parabens, formaldehydes, and non-carcinogenic. Strawberry is known for its anti-aging properties and with the combination of olive oil it also gives you a smoother, better hydrated skin. The soap is pinky white in colour with tiny specs of strawberry i guess :P It smells like strawberry yogurt according to me... not one of my fav things to eat but i definitely love the fragrance of this soap that lingers in my bath for a while after my shower. The soap maintains its shape and lasts for a really long time. It lathers really well and keeps the skin moisturised. I like the packaging of these soaps, its pretty simple but very different from the usual soap packaging. 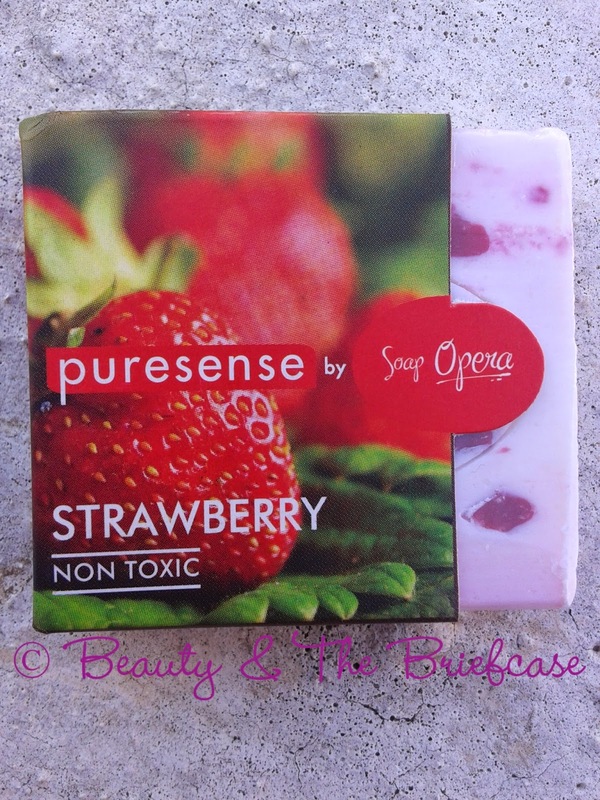 I totally loved using this soap... currently I'm using another soap from this brand and I'm delighted :) Keep watching this space for more Reviews of some lovely soaps from Puresense. For the time being check out their Facebook page for some lovely products! 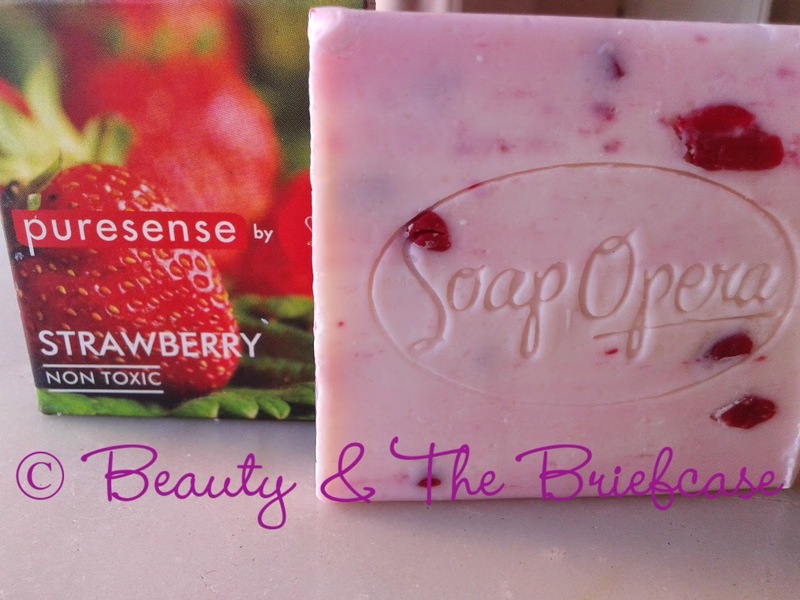 Coming to the soap, I love strawberry yogurt and I can imagine how yummy this soap must be smelling. I so feel like trying this. Puresense range is quite temping. They have great variety of soaps and their unique sleep inducer sounds interesting. Hope to see to you blogging regularly in 2015.